Renovating and designing homes is so much fun for me. I feel so blessed that I get to do what I love every day. It’s like getting to go to the park each day and play. As a designer and homebuilder, it’s the little details that matter most to me. Even something as small as cabinet hardware can make such a big impact in the space you are designing. Today there are so many different styles, shapes, and metals to choose from. Lucky for us! I personally love to mix metals and I always look for interesting shapes much like I do when I shop for jewelry pieces to add to my wardrobe. I always say, “Lighting and cabinet hardware is the jewelry to your home”™ because it is. So have fun with it! It’s the perfect opportunity to infuse your own personality and style into your room and really make it shine bright light a diamond! Just like you. 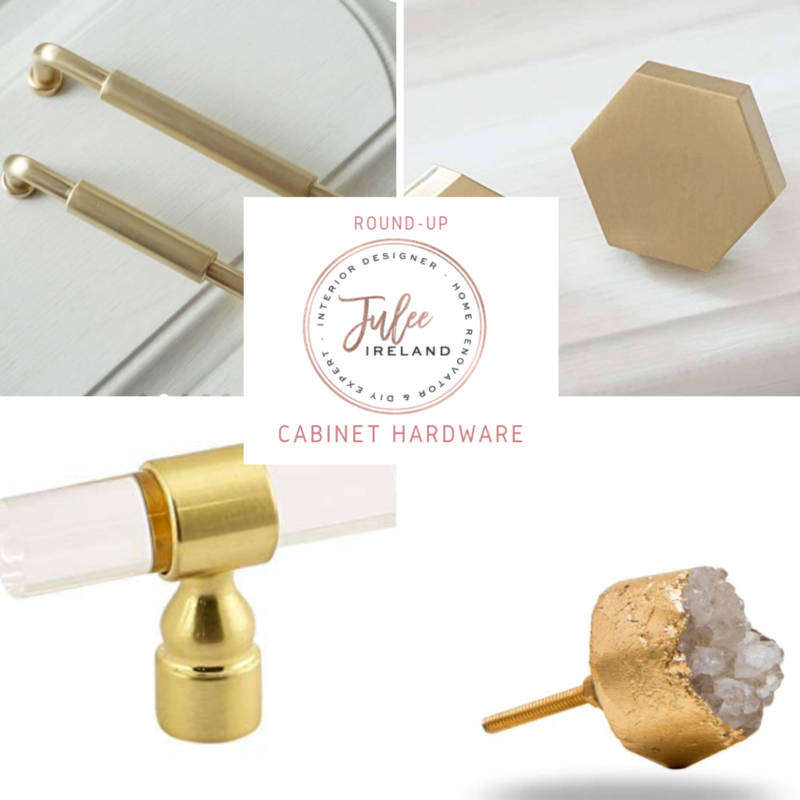 Here are four unique cabinet hardware styles that I love with budget-friendly prices that I think you’ll love too! Enjoy and let me know what you think. Oh Hello, Gorgeous! I was so happy to see the revival of Lucite make it’s debut again in the interior design world and I am not ready to let it go just yet. Please, let’s keep it around a bit longer. It’s just so elegant and I love the mix with the gold metal on this drawer pull. So chic! Gold is still really a strong trend but finding the perfect tone can be difficult. I think the gold tone of this pull is perfect and I love its simple and unique style. Based out of London, UK this cute shop has so many unique pieces. I cannot get over these gorgeous and very chic knobs! What an eye-catcher! I am so tempted to take one and DIY myself a pendant necklace or turn them into napkin rings for my next dinner party! I am still obsessed with the shape of a hexagon so naturally; I went a little goo goo gaga over this simple gem! I love these knobs and I think you need them as much as I do! Do you have any of your favorite cabinet hardware shops or unique finds that you’d be willing to share? Don’t hold back. I’d love to see what you got!